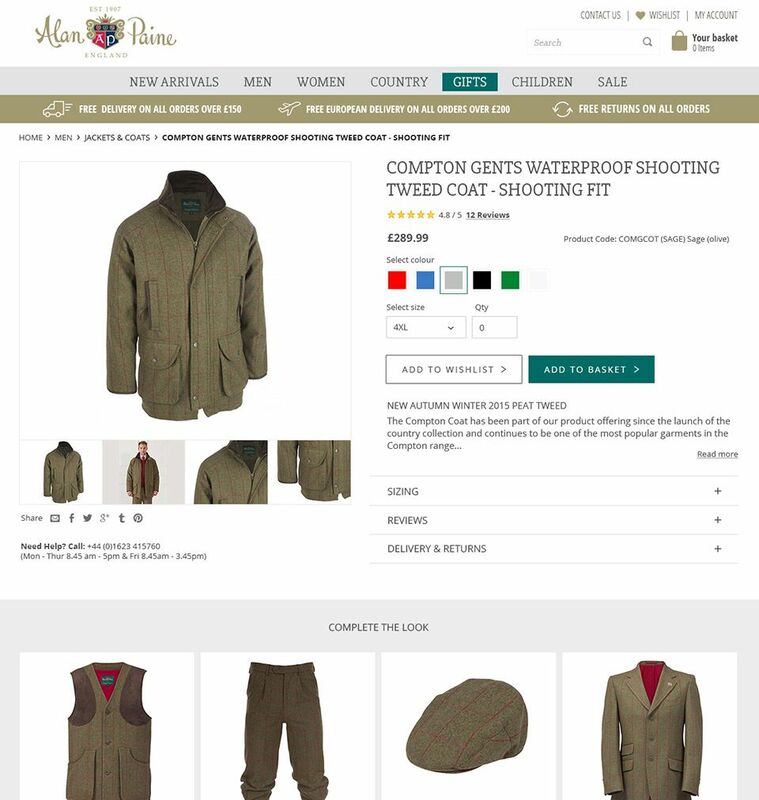 Producing work for leading country clothing company Alain Paine, was an exciting proposition. Alan Paine was established in 1907, and following business success in the States, the retailer expanded to Europe with the opening of its first store in the historic centre of Rome in 2011. Their most recent phase of business development was to create a user friendly, responsive website. Alan Paine’s old site was built on a desktop Magento template and it was our job to create a Magento store that would respond over multiple devices. For a cost-effective solution the client opted for our ‘boiler plate’ theme and a partially bespoke design process focussing on Store Locater, Category and Shopping Cart pages. As well as being cost-effective for the client, the approach of creating new templates and using pre-existing templates enabled our client to inherit our inherently SEO friendly theme, which has scored 98/100% on a 3rd party SEO Audit website. As well as bespoke elements, the website needed to integrate with the client’s own CRM system, ARIA. Our Magento certified frontend developers created bespoke templates, including a Store Locater, Category and Shopping Cart page - matching the look and feel of our Magento template theme. We invested time in HTML/CSS to ensure new branding was consistent across the entire website. At planning stage the client pointed out they were losing mobile sales so along with the responsive templates we also implemented a one-page checkout to make purchasing as easy as possible. With full CRM integration, the client’s CRM system, ARIA, now automatically updates product ranges, prices and available stock every 15 minutes and auto updates data during their quietest hours to keep user-experience at an optimum.